2015 was a year of ups and down for stock market. In January 2015, Sensex started its journey from 27500 and today it is on a level of 25158. Sensex was volatile during an entire year. Except few midcap stocks majority of the large cap were under pressure. Soon we will be entering into New Year 2016. New FDI reforms, GST and Federal Reserve meeting will be few driving factors for the Sensex in 2016. I hope that 2016 will be a good year for the stock market and Investors. 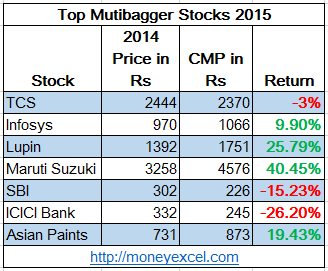 Before moving ahead with 7 Multibagger stocks of 2016, let’s do a quick recap of 7 multibagger stocks which was suggested by me in 2015. Out of these seven stocks, four stocks turn out to be winner and wealth generator for investors. Stocks like Maruti and Lupn were able to generate 40% and 25% returns for the investors. 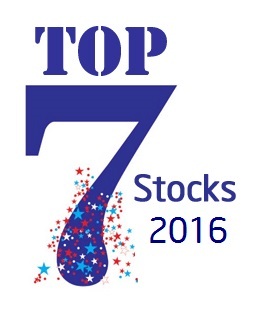 Keeping the same pace and positive thoughts here is top 7 multibagger stocks of 2016. Maruti Suzuki is first Multibagger stock for 2016. Maruti is a leader in automobile industries of India. Maruti has recently launched new cars like Vitara S and S-cross. 2016 is expected to be a good year for this stock. This stock will also get an advantage of upcoming 7th pay commission salary hike. I recommend purchasing this stock with target price of 5250 Rs. Eicher Motors is another multibagger stock for 2016. In 2015 third quarter, Eicher Motors profit margin is increased by 55.2% (256 Cr). An increase in operating margin and growing revenue are positive points about this stock. It is recommended to purchase this stock with target price of 18000 Rs. Lupin is one of the best and hot favorite stock of mine. I have invested in this stock at the level of 630 Rs. Lupin gains advantage of both domestic and international market. R&D and new product launches drive this stock. It is recommended to stay invested in stock with target price of 2100 Rs. Sun Pharma is the next pharma stock I am bullish about. Sun Pharma is a consistent performer and very good stock for long-term holding. Sun Pharma also enjoys the domestic and international market. Recently they have sold their US manufacturing facility to US Company. I recommend investing in a stock with target price of 1000 Rs. All stocks of banking sector were down in 2015. However, it is expected that situation will improve in 2016 and banking stock will likely to outperform. This is mainly due to GST and upcoming infrastructure projects. The first stock of banking sector is HDFC. I recommend purchasing this stock with target price of 1300 Rs. SBI is next banking stock I am bullish about. SBI is largest public sector bank of India. SBI is planning to transform into a full-scale digital bank. This will surely improve customer satisfaction and bring new business. I recommend investing in SBI with a target price of 270 Rs. Asian Paint is last multibagger stock for 2016. Upcoming smart city project and revival in real estate sector could be driving factor for this stock in 2016. I recommend purchasing this stock with target price of 1000 Rs. If you enjoyed reading this article, do share with your friends through facebook and twitter. Note – Stock recommendation given above is after careful research and study; if required you can concern financial advisor or expert before taking any position in above stocks. What are your viewes on V2 retail? V2 Retail was making losses. Recently company has posted profit. It is very early to recommend anything on the stock.However, I will not recommend V2 Retail for investment. Nice collection of some hidden gems here. Smart investors always grab opportunity to find multibaggers in market turmoil only. yeah its true before investing and thinking of jackpot one must examine the quality and growth potential of the stocks. Its all about its fundamental, valuation in term of PE, efficient management, previous track record and future prospect of the company.